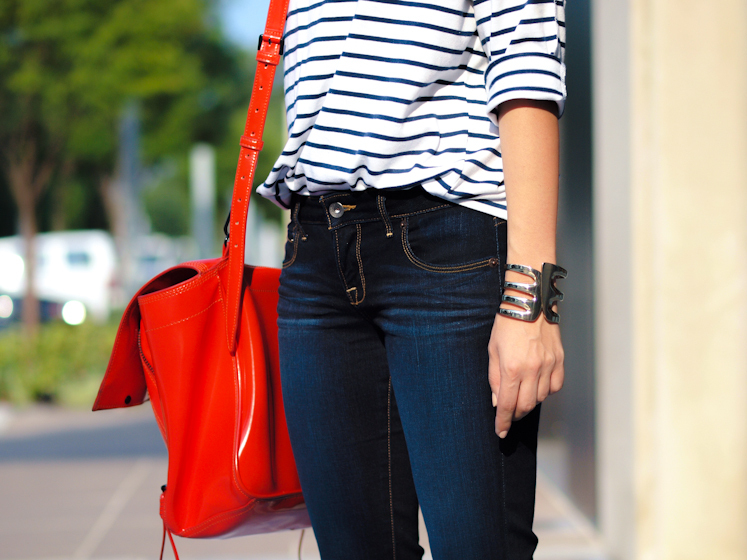 Nautical stripes, red pumps and blue jeans were the perfect classic combination for my second day in New York. Tuesday I had the pleasure of spending the entire day with a very great company and in a very nice place: Americana Manhasset, a high-end shopping center! You'll find out more about this visit in my next post! The classics suits you so good! I am totally in love with those tomato red court shoes! very nice outfit! i love the kombi and the colours! wanna check out my blog,too and follow me? Your bag and cuff are perfect! Lovely look Veronica! Simple and chic! Perfect looking! Red and blue harmony. Totally into classics, even more when it brings us a chic navy look! you are looking amazing honey! love the casual striped shirt and the red heels:) sooo pretty! I will be glad if you visit my new blog. Beautifully French chic and urban! That’s a classy combination which never fails. Love your pumps, I’m looking for a nice pair of red stilettos already for quite a while! what a classic, chic outfit. I adore stripes!